I realized the other day that I was woefully behind in completing my Cruisin' with the Cozies reading challenge and the year is too fast coming to an end. So I went off to the library to see what was there and imagine my surprise when I came across an Agatha Christie mystery set in WWII. 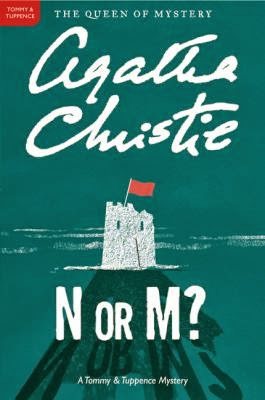 I have read Christie but it has be mostly limited to Hercule Poirot and Miss Marple mysteries. I was totally unfamiliar with her Tommy and Tuppence novels but was very pleased to discover N or M? "...is the danger of Troy - the wooden horse within out walls. Call it the Fifth Column if you like. It is here, among us. Men and women, some of the highly placed, some of them obscure, but all believing genuinely in the Nazi aims and the Nazi creed and desiring to substitute that sternly efficient creed for the muddled easy-going liberty of our democratic institutions." The plan, then, is to tell Tuppence he is off to Scotland to do some boring office work for the Ministry. Imagine his surprise when he arrives at Sans Souci and discovers Tuppence is already there. And, in true Christie style, Sans Souci is the perfect wooden horse, presenting a cast of innocent looking men and women, any of whom could be N or M. There is the mysterious proprietor Mrs. Perenna and her war-hating daughter Sheila in love with Carl von Deinin; the German refugee Carl von Deinen, whose two brothers are in concentration camps, and whose father has already died in one, and mother has died of fear; Mrs. O'Rourk, a rather nosey heavy set woman with beard and mustache, who had a antiques shop in London, now lost in the Blitz; the elderly perpetually knitting for the troops Mrs. Minton; the young Mrs. Sprot, whose husband sent her out of London with her daughter, Betty, 3 fearing for thier safety in the air raids; the elderly hypochondriacal, wheelchair-bound Mr. Cayley and his weak wife; and finally, Major Bletchley, all army, all country. Into this come a very suspicious looking Polish woman, as well as the local ARP warden and former navy man, Commander Haydock. N or M could easily be any one of these characters. But nothing is as it seems here, and the trick is not to be taken in by appearances. As always, Christie has you guessing til the end; well, if truth be told, only in regard to the male N. The female agent M was pretty easy to figure out. I found Tommy and Tuppence Beresford to be charming, engaging characters. though for me, not quite as engaging as Peter Wimsey and Harriet Vane. But it is certainly an entertaining, light, rather witty novel, and I thoroughly enjoyed it, despite guessing M early on. And N or M? proves that Christie can write a good spy thriller as well as her wonderful crime fiction. And because there is a 3 year old character, Christie once again makes good use of children's books and nursery rhymes throughout, such as Goosey Goosey Gander, one of Betty's favorites. N or M? was published in March 1941. 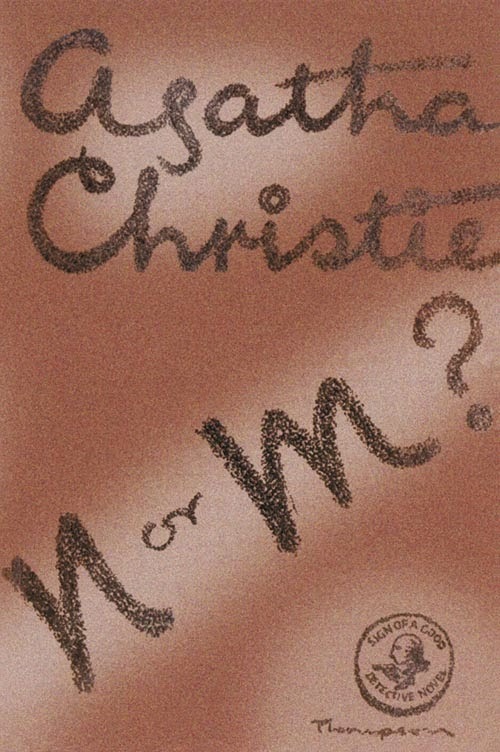 It is one of two that Christie penned during the war, the other novel being a Miss Marple story called The Body in the Library in 1942. It is the third of five Tommy and Tuppence novels, spanning the years 1922 to 1973. Unlike her other detective characters, Tommy and Tuppence age over the course of the novels. And though they describe themselves as old in N or M?, they are really only middle-aged, but are still bright, witty, charismatic characters who would most likely appeal to teen readers just getting into mysteries. "Bletchley? My dear, I was stuck there on my way by train from Oxford to London and took revenge by giving the name to one of my least lovable characters." Love Agatha Christie...didn't know about this book.